The Brimfield, Ohio Police Department announced this week that they are redoubling their efforts in the name of safety, pulling over as many citizens as they can. Not only that, they are profiling a certain group known to “travel in groups”. Under my command, we have always been an agency which has not issued a lot of tickets. We make a good amount traffic stops and arrests, yet we issue few citations. That all changes on Monday, June 9th, 2014. For the summer, we will become an agency with a mission to write tons of tickets. We are not doing this for the revenue. We are doing it for your own good. As part of this mission, we will be profiling a certain group of people. If you belong to this group of people, I will not apologize for the inconvenience if you are stopped. It is not harassment, so don’t go there. I am ordering my officers to stop anyone belonging to this specific group, we will immediately stop the person or persons (sometimes they travel in groups) and give them a ticket. As part of “Operation Safe Summer,” officers are ordered to stop anyone appearing to be 15 years of age or under who is riding a bicycle and wearing a helmet while doing so. They will then issue the youthful offender a ticket for a free ice cream cone from Frank’s Drive-in. Last year we gave away nearly 200 free ice cream treats. It sent a strong message… and we are sending one again this year. Thank-you to Frank’s for the support again this year! Chief Oliver has become quite the Facebook sensation. Even though his town has a population of only 10,000 with 14 full time officers, he’s managed to accumulate over 70,000 fans. His initial plan was to connect with the community and promote positive communication. 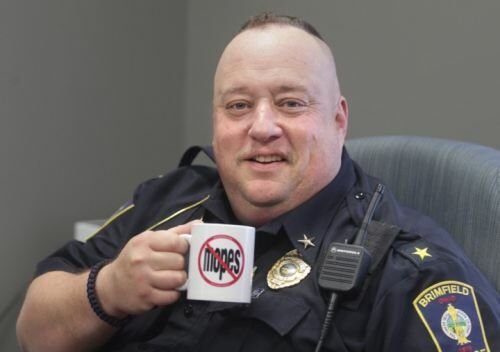 Not only has he achieved this, but he’s been praised worldwide for his insistence that officers issue at least one goodwill ticket per shift, especially while “targeting” small children. 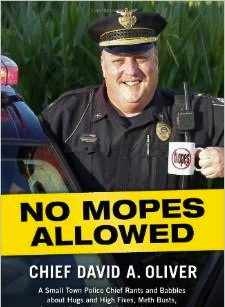 He is also the author of a book, No Mopes Allowed: A Small Town Police Chief Rants and Babbles about Hugs and High Fives, Meth Busts, Internet Celebrity, and Other Adventures . . .